I write about scams fairly frequently on this blog. Sometimes it’s because of a new one I’ve just heard about, and I want to warn my readers to be aware of it and not get taken. In some cases, it’s because I’ve just had to deal with a client who has become the most recent victim and lost money or had their computer compromised or infected. Those stories don’t usually have a happy ending. But today, I’m writing with some good news. 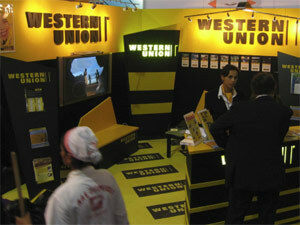 With a lot of scams, there is one common element: Western Union. When a scammer wants you to send money, there are a lot of different reasons they come up with but usually only one method, which is Western Union. When you send money to someone via Western Union, it’s pretty much the same as handing over cash. There is no identity tracking to determine who got the money, so after you pay the money and then later on realize you’ve been scammed, you have no recourse to try to get your money back. It’s just gone. It appears that Western Union was at least partially at fault. They received “hundreds of thousands” of complaints about money transfers related to fraudulent lottery schemes, fake family emergencies, advance-fee loans, online dating and other scams. In spite of being aware of these things, they failed to act. They also failed to discipline problem agents, and they failed to have effective anti-fraud policies. In the face of all that evidence, Western Union has settled with the Federal Trade Commission and agreed to pay $586 million to victims that file a claim. So if you were a victim of a scam and lost money by using Western Union, be sure to file your claim. You start this process at FTC.gov/WU and just follow the instructions there. Don’t procrastinate, because your claim must be filed by February 12, 2018. Some people are asking, “What if I don’t have any documentation proving I was scammed?” This would not necessarily be that unusual, since the scammers don’t typically provide a lot of paperwork for a trail. And the scam may have happened years ago, so you might not still have copies of those old emails that went back and forth. File your claim anyway, and provide as many details as you possibly can. 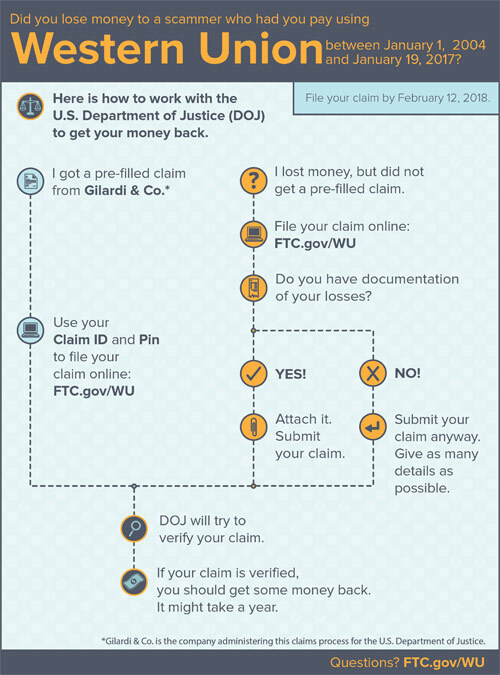 Even without documentation, the Department of Justice will try to verify your claim, and if they do, you could get some money back. Now here’s an interesting little twist. This settlement will probably result in a NEW scam. Obviously, anyone filing a claim in this situation, by definition is someone that has been scammed before. The scammers know this and will be counting on the possibility that those people are still susceptible to being scammed again – so these crooks will be offering to “help” in the claim process by filing the claim on the behalf of the victim – for a fee, of course. Don’t pay anyone to file the claim for you! Filing your claim is free and it’s not difficult, so don’t get scammed a second time. You might not get back ALL the money you lost, and the money you do get back could take a year before you actually see a check. But it’s worth taking a minute to put in your claim. And hopefully Western Union will get its act together so this stops happening so frequently. VISA for scams provided by QVS: Quad Vector Solutions & Easy Pro Care. Can I get a refund , if I claim this ? Even a partial one from April 2015? Refunds would be unlikely going that far back. Sorry.